Stefan Steiniger and Andrew J.S. Hunter, 2013. 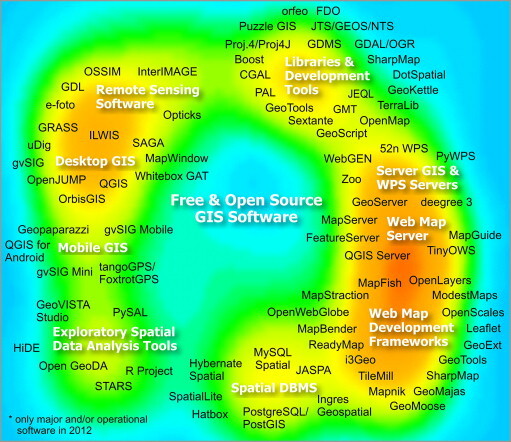 The 2012 free and open source GIS software map – A guide to facilitate research, development, and adoption. Computers, Environment, and Urban Systems. Volume 39: 136–150. From the paper: "Over the last decade an increasing number of free and open source software projects have been founded that concentrate on developing several types of software for geographic data collection, storage, analysis and visualization. We first identify the drivers of such software projects and identify different types of geographic information software, e.g. desktop GIS, remote sensing software, server GIS etc. We then list the major projects for each software category. Afterwards we discuss the points that should be considered if free and open source software is to be selected for use in business and research, such as software functionality, license types and their restrictions, developer and user community characteristics, etc. Finally possible future developments are addressed."